Madison joined Weare Animal Hospital in May of 2018. Before working at WAH, she worked in retail for four years at Petco as the companion animal leader. That role showed her how to care for, medicate, and fall in love with all kinds of animals. Madison also worked at Petco as a certified dog trainer, which helped her understand dog behaviors and reactions. After Petco, she worked for a small pet business as the assistant manager where she learned more about the diet and nutritional needs for dogs, cats and exotic animals. She has always loved providing excellent customer service and is happy when working around animals and wonderful people. 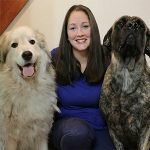 Madison lives in Concord with her husband Brandon, her 2-year-old daughter Elena, and four big dogs Echo, Crash, Harley, and Daisy, along with her Conure Bennie. Her hobbies include being part of an amazing nonprofit organization that helps children in need called Champions of the Kids, painting with her daughter, and nature photography.